This is a recipe for Potato Casserole with Corn Flakes. It’s an absolutely delicious potato casserole side dish to feed a crowd. For breakfast or dinner, this potato casserole is a perfect side for bacon or sausage or served alongside your favorite chicken dish for dinner. 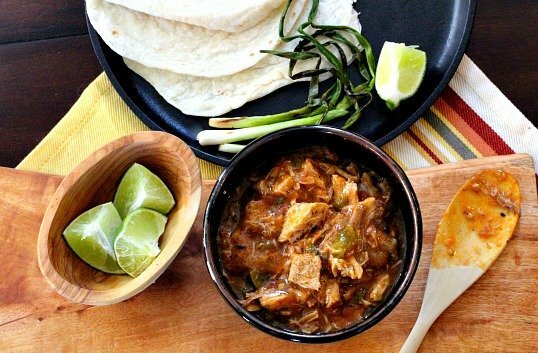 And don’t forget to save this one for your next pot luck. 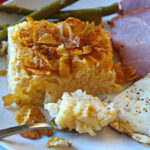 Where did I get this Potato Casserole with Corn Flakes recipe? First of all, I want to make it clear that I wouldn’t know Grandpa Johnson if I passed him on the street. But if I did know him, I’d most certainly stop him and thank him for this recipe. My Mother’s last years were spent at a care facility in South Hutchinson, KS. She had stayed on our family farm a few miles west, until she was 90 years old, living alone after my father’s passing 20 years earlier. She was a tough old bird (her words) and I truly admire her strength and fortitude for taking care of that house and the four acres that surrounded it for all those years. And for that matter, taking care of herself. Time finally came, and she made the decision to move into an apartment at Mennonite Manor. A facility that provides homes, duplexes, apartments, assisted living and nursing home options. She passed through three of those phases, apartment, assisted living and finally nursing home. A couple of years after she moved into her apartment, she announced the facility was creating a cookbook. And you bet, I received one as a gift. The cookbook is filled with homestyle, country, Dutch Amish and Mennonite recipes. Every once in awhile, I’ll pick it up and browse and my waistline grows just reading the ingredients of cream, butter, sugar and flour. 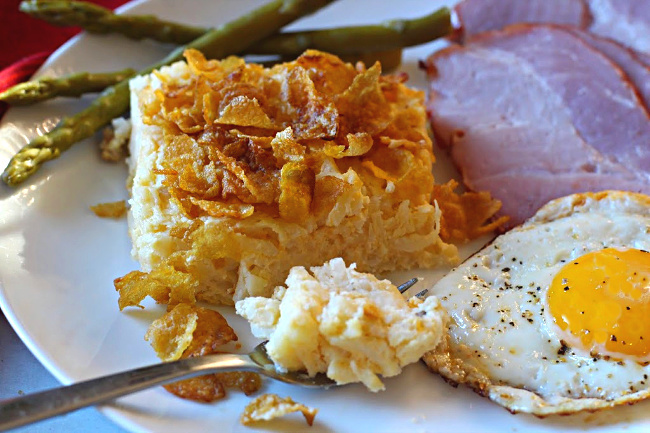 Curiosity got the best of me when I came across this recipe for Grandpa Johnson’s Potato Casserole with Corn Flakes. I mean really, how can anyone resist, hash brown potatoes, cheese, sour cream, butter and a topping of crusted sweet Corn Flakes. I had to give it a try. And after all, it appears everyone loves a good old fashioned cheesy casserole recipe, as my recipe for Broccoli Cheez Whiz Rice Casserole is one of the most popular on my site. In a large bowl, combine thawed frozen hash brown potatoes, Cheez Whiz, dried onions, sour cream, and a can of cream of chicken soup. Turn this mixture into a 9 x 13 greased baking dish. Top with two cups of corn flakes that have been mixed with melted butter and bake. After it’s baked, it almost has the consistency of mashed potatoes. And some great flavor comes along with it. Creamy, cheesy and with a crunch of sweet Corn Flakes, it’s one of those things you don’t have to worry about asking for 2nd’s – it’s the 3rd’s and 4th’s that create the challenge. You know you’re in for a treat as it bakes. The smell is intoxicating. And the end result is a potato casserole that’s simply irresistible. Perfect for brunch, or a pot luck, and especially nice for Easter. A great side dish for ham. 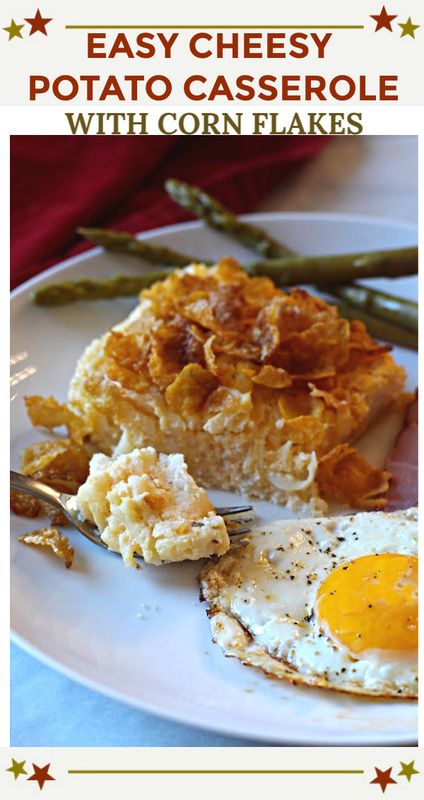 I hope you give this cheesy potatoes with Corn Flakes recipe a try. And if you do, please come back and give the recipe a star rating and leave a comment about your experience with the recipe. And if you have a favorite hash brown potato casserole recipe, let me know, I’d love to give it a try. An absolutely delicious potato casserole side dish to feed a crowd. For breakfast, dinner, pot luck or Easter. It's a crowd-pleaser. Thaw frozen hash brown potatoes and place them in a large bowl mixing bowl. In a smaller bowl, mix Cheez Whiz, onions, sour cream, cream of chicken soup. A few minutes in the microwave will help make this easy to stir together. Pour this mixture over the potatoes and gently stir to combine. Add salt and pepper to taste, Keep in mind, the soup and cheese are salty, so be cautious with added salt. Pour the potatoes into an 9 x 13 inch casserole dish. In a large bowl, gently combine melted butter with corn flakes. Spread this mixture over the potatoes. Bake 350 degrees for 40 - 45 minutes. Mixture needs to be nice and steamy and Corn Flakes starting to brown. I made this recipe with shredded frozen hash browns. It would most certainly work with country style cubed hash browns. All that would change is the texture. More potato casserole with corn flakes eye candy. I served this with sliced ham, a fried egg and asparagus. A perfect menu for a very easy brunch. My sister in law made a similar dish for a family gathering a few years ago and we couldn’t get enough of the crunchy topping on the shredded potatoes. She said in Minnesota lots of dishes use corn flakes for that crunchy bite on top. Ahhh! Love this and love you! I look forward to my email notifications from Cooking on the Ranch! I have been following your blog for many years and have tried some recipes . Just wanted to let you know that my husband and I just moved to Hutchinson this December. 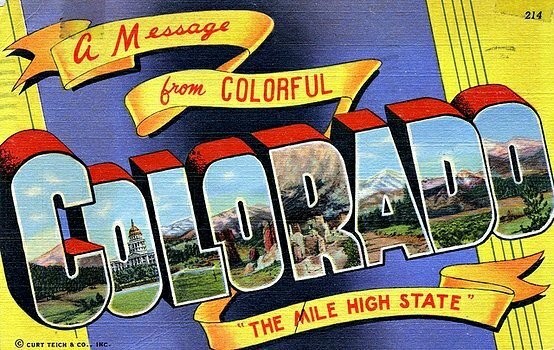 I have lived in Denver for 48 years. We decided that Denver area was getting to big for us. Just retired and wanted some place slower and affordable. Plus husband is from Wakeeny. So when you write about Hutch I’ll be thinking about you. Tell me more about the Cream of Chicken soup. Like, the amount. I would like to make this one. Lea Ann, when I saw this on Twitter the other day, I instantly wanted some. What a blast from the past! It’s very similar to a potato dish that was going around my community a few decades ago. Some of us tried to health food it up a bit, but wouldn’t turn down a serving of the good old-fashioned “processed foods” version at someone else’s table! 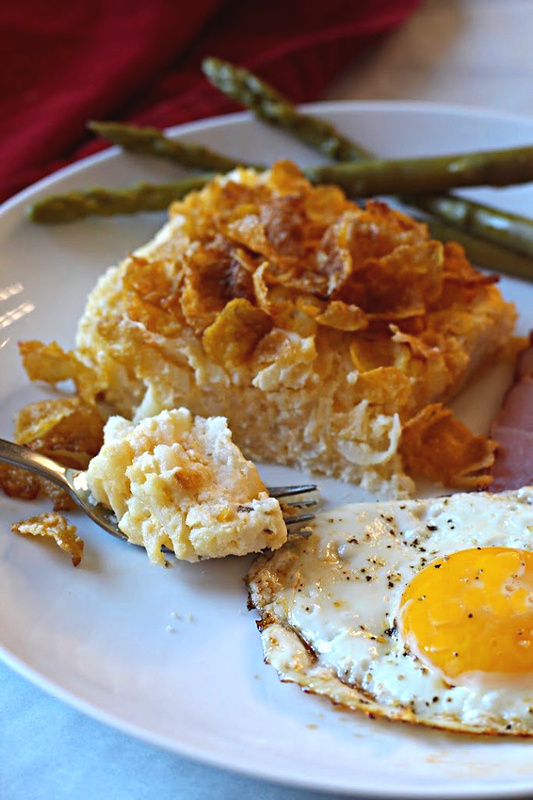 But we never had it with ham and eggs, always as a dinner side dish. Your beautiful plate of food is making me hungry. What an irresistible dish! When I saw “corn flakes” I immediately thought of my grandmother who used to make a potato corn flake dish. It’s been SO LONG since I’ve had it that I have no idea if it’s the same one or not, but I’ll just have to give it a try and see if it sends me down memory lane. 🙂 And what a fun cookbook to have!! Hi MJ. Yes, this is an oldie but goodie. No one in my family ever made it – but I’ve had it a couple of times so long ago. It’s really good. That corn flake topping looks so good! I really like how you paired this with ham and eggs.